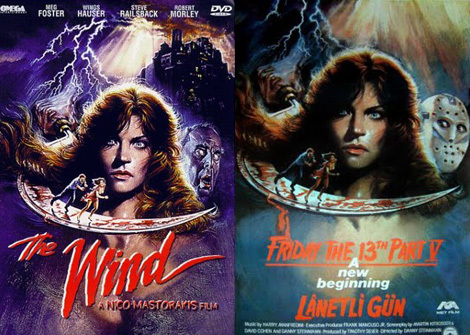 This writer found out about a really cool looking Turkish poster for Friday The 13th: A New Beginning a few years ago and something looked a little familiar about the artwork. A year or two passed by and then I posted a story about the poster last year on another website and Friday the 13th fans loved it. However, there were a few people that saw similarities that I thought were present. The Wind is a fairly cheesy, but somewhat entertaining horror film from 1987 that starred the likes of Meg Foster and Wings Hauser. Looking at the poster now, the woman highlighted front and center in the promotional piece is a dead ringer for Meg Foster. Of course, the one problem is that the artwork is almost identical to the Turkish A New Beginning poster. Although A New Beginning was released in 1985 in the U.S., Turkey released the film later in January 1987. So it is conceivable that the artwork created for The Wind was manipulated to be used for the Turkish release of A New Beginning. It is a strange relation and makes one wonder if there is some sort of copyright infringement happening in this case. Perhaps the same artist was commisioned for both movies and got lazy and decided to use one design for two movies? Take a look at the posters below and offer your thoughts, opinions, or knowledge on this curious promotional situation.